‘Eat your colors’ nutritionists say. Indeed, if you are shopper with limitless resources its easy. My takeaway from surveying the beautiful and bountiful harvest at MCGO is the colors. When your resources are very limited, most go ‘beige’ on the diet. Fill up and get ready for the next day. 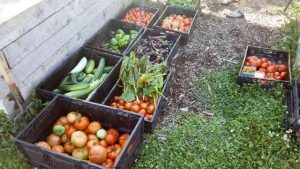 Meadowbrook Community Gardens and Orchards (MCGO) weekly put together a harvest that helps make a difference. Indeed, nutritionists will say a variety of colors in one’s diet seems to equal better overall health, especially in relation to produce. So, the challenge is how to engage resources available and are there enough? MCGO works weekend and weekend out. Dealing with pests, vandals, bad weather and limited schedules. 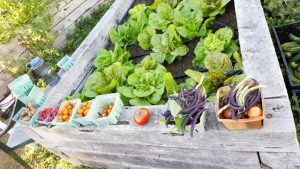 And yet, the growing season produces an abundance of CARE, effort and colorful results. Helping to improve the diet of those in need… good work, MCGO. 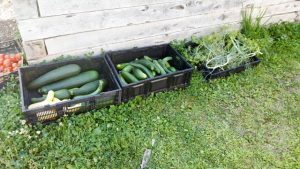 three kinds of cucumbers, plentiful ‘finger’ egg plant and monster sized tomatoes.